Egyptian President Muhammad Morsi’s UN debut as that nation’s first democratically elected leader marks a historic event in the region by any standard. Yet, while he promised that Egypt would once again take the lead on regional challenges, like the Syrian civil war and Middle East nuclear non-proliferation, he also seems to have jumped on the bandwagon in calling for a curb in freedom of expression. All this brought to light again by the now-infamous YouTube video “Innocence of Muslims” that is cited as the cause of rioting from Libya to Indonesia to Afghanistan. Granted, even Americans are grumbling about the content of questionable value floating around the Internet, mostly in obscurity; but shocking events, like the killing of U.S. 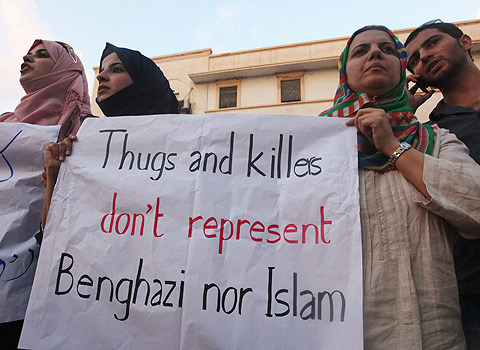 Ambassador Stevens, remind us that not all cultures tolerate distasteful material in the same way – especially in religious matters. That being said, Mr. Morsi’s comment that Egypt won’t tolerate freedom of expression that is “used to incite hatred against anyone,” opens questions about the strictness and implementation of such a policy. 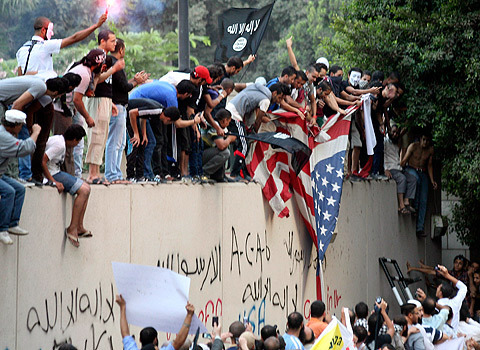 Current efforts of the Egyptian government leave much to be desired. Showing contempt for Islam, Christianity, and Judaism can earn you up to five years in jail, and liberal activists say that the vague wording leaves the law vulnerable to exploitation by political opportunists. Just last month an Egyptian Copt was arrested for posting a link to the infamous video, but when a conservative satellite TV host, Khaled Abdel Allah, first broadcast the clip on his show he suffered no repercussions. Rarely do these statutes persecute people who allegedly defame religions other than Islam. How will Mr. Morsi shore up freedom of expression laws to protect all religions equally, much less all segments of the population? There is also the looming unknown of how Egypt will cope with the vast proliferation of inflammatory materials readily available on the Internet. Many Middle Eastern leaders have called on Western countries to adopt more rigorous censorship, but to that, well, I can already see the headlines about America coming under Shari’a law. If they can’t stop the flow of social media from the source, the only other option is to stop it at the (virtual) border. Iran has one solution – to intermittently censor sites and endeavor to build its own closed Internet. The Chinese government is building a search engine with built-in censors to complement the "Great Firewall of China." Despite the question of whether they'll prove effective, the Egyptian public would surely balk at such totalitarian measures since they found their voice in January 2011. Can the newly elected Egyptian government find a middle ground on issues of freedom of expression? Of course, the U.S. has a long history of revising that middle ground, and the Constitution does not protect certain categories of speech, like defamation, slander, libel, fighting words, incitement, etc. But how can a government restrict speech that inspires an emotion, even one as pernicious as Islamophobia? (In the case of the YouTube video mentioned above, coverage of the rioting did more to inspire Islamophobia in the U.S. than the video itself, which is considered to be nonsensical satire by every American I've asked.) At times the American public, too, struggles to tolerate broad protections for freedom of expression, referring to the Westboro Baptist Church protests of soldiers' funerals or radical preachers vowing to burn the Quran. However, silencing a people doesn't make their ideas disappear - a lesson that the Muslim Brotherhood in Egypt should well know. While I find increasingly mainstream currents of Islamophobia deeply troubling, I would implore Mr. Morsi to focus his efforts on changing the perception of Muslims and Islam in the West rather than relying on censorship to keep the peace. The Muslim Brotherhood has already surprised the world by adapting to a democratic system - maybe they'll surprise us again. "Iran Readies Domestic Internet System, Blocks Google"
"At U.N., Egypt and Yemen Urge Curbs on Free Speech"
"Egyptian blogger's arrest shows difference in views over freedom of speech"